We have an extensive range of swimming lessons and activities for children. Epworth Swimming Pool has a wide range of adult only classes and lessons. We have a range of fun swimming activities for the little ones. Keep up to date with the latest swimming news from Epworth Swimming Pool. Epworth Swimming Pool – your local fun filled swimming pool for Toddlers, Children and Adults. Whether you are just setting out on your swimming lessons or are an experienced swimmer, we have a swimming class just for you. Our swimming for toddlers class “Aqua Babes” is designed for the under 5’s and a great way to introduce your toddler to water. Our swimming for children classes range from beginner classes right through to the advanced and life saving classes. 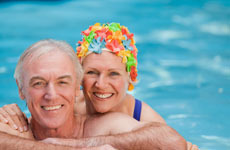 For adult swimmers we have Aqua fit, Aqua Tone and over 50’s swimming classes. As well as normal public swimming times, we have Early Birds morning swimming, Pool Parties, Swimming for Schools to name a few. So whatever your level of swimming, whatever your age – come and enjoy your swimming at Epworth Swimming Pool.